PRE-SALE DISCOUNT TICKETS ON SALE! BECOME A VIP BY JOINING EMAIL NEWSLETTER...SAVE $$$ ON TICKETS AND ON FUTURE EVENTS! NEW this year; French Fry Battle, A Spud Affair! All VIP and GA Ticket holders receive UNLIMITED Burgers, Bites, Beer, Wine and Spirit tastings. Each hand-picked chef will create their grilling masterpieces and present them to a prestige table of Grill Master Judge's which includes a few well known "burger conneseuirs" like Rey De La Osa, Chief Grill Master Team Captain from Publix Aprons Cooking School, newcomer Chef Irie from Chef Irie 'Food On Fiyah', Executive Chef Jason L. Smith from STEAK 954 - W Fort Lauderdale Hotel, Ghia from Co-host of morning drive alongside Paul Castronovo on BIG 105.9, Former Commissioner Robert S Weinroth from City of Boca Raton, and Douglas Heizer from The Boca Raton Tribune. The Grill Master Judges will determine which contender's burger is deserving of 1st, 2nd and 3rd Place awards of Best Grill Master; while the guests vote with their wooden chip for "People's Choice" and will determine the champion to hold the title as Best Battle Burger. Defending 2018 Champions ROK:BRGR, will be back to defend their 2017 and 2018 People's Choice WIN for "Best Battle Burger" and Funky Buddha Brewery will be back to defend their 2018 1st Place WIN for "Best Grill Master" as well as 2nd Place WINNER Tucker Duke's and 3rd Place WINNER Cheffrey Eats. This year's "Master of Ceremonies" is being hosted by Rob Calvert, from the Paul Castronovo Show on Big 105.9. The Sizzling Summer Festival is held in Sanborn Square Park in downtown Boca Raton near the intersection of Palmetto Park Road and Federal Highway. Please visit the Location page to see where the Will Call Entrance is located. This community event with its "Backyard BBQ" theme not only showcases some of the best burgers in south Florida that can be found, but also has an array of summer food tasting stations sampling gourmet food items. You can quench your thirst with a variety of craft beer, seasonal spirits and summer wines. Portion of proceeds from the Boca Burger Battle benefit PROPEL, www.PropelYourFuture.org, People Reaching Out to Provide Education and Leadership, a 501c3 Non Profit Organization located in Boca Raton. PROPEL's goal is to address the needs of youth and be a catalyst for change, one life at a time. They offer weekly programming and special events in the areas of arts, education and recreation to best forward the future of our youth. The Boca Burger Battle is presented by WineEvents.com, and produced by south Florida event production company BocaRaton.com & The BITES! 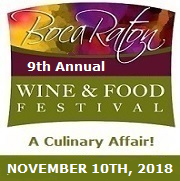 Network, which also produces the Boca Raton Wine and Food Festival every November. General Admission Tickets are Pre-Sale $50 Per Person / Regularly $100 and VIP Tickets are Pre-Sale $75 Per Person / Regularly $125. ALL TICKET HOLDERS RECEIVE UNLIMITED Burgers, Bites, Beer, Wine, Spirits, Live Entertainment and TONS of FUN! A BONUS TO VIP TICKET HOLDERS, they enjoy EARLY BIRD ENTRY AT 6 PM instead of 7 PM for General Admission guests. This is a 21+ year old event from 6 pm to 10 pm, PLEASE, No Pets! Event is Rain or Shine! So, NO Refunds Battle Fans... You can purchase Tickets Online or call 561.338.7594. We're looking forward to seeing you at A Grilling Affair! We are always searching for the highest social media rated burger joints. And, this year we would also like to hear about your favorites. We know you search for 'Best Burgers Near Me' and we search for all of the 'Best Burgers in South Florida'. Tell us your Best Burger West Palm Beach, Palm Beach County chefs as well as others who have the Best Burger Recipe in Florida! Gypsy Lights is a unique musical collaboration of boomer musicians from both the United States and United Kingdom that specialize in live music from the 60�s through the 80�s. We also mix in a few classics from the late 50�s and a few newer tunes from the 2000s. Our shows highlight the timeless music of artists, such as The Beatles, Everly Brothers, Roy Orbison, Lovin� Spoonful, Mamas & Papas, Stones, Rick Nelson, Johnny Rivers, Animals, Zombies, Kinks, Doors, Chuck Berry, Fleetwood Mac, Joe Cocker, Elvis, The Supremes, and many more! We perform at all types of venues; big and small. We are known for not using backing tracks or any computer enhancements; just real instruments and live vocals and pay tribute to a variety of great musical artists. Come dance, listen and sing along with us to great hits from days past with some of the best songs from Rock, Rockabilly, Soul, British Invasion, and Pop Rock. TAKE A BITE AND JOIN THE BATTLE!